Leslie Jean-Mary, Multicultural Outreach Coordinator for the Gift of Life Donor Program, came to Spectrum to share about the need for organ and tissue transplants. Her insightful topics ranged from people wondering if there is an age limit for organ donation (health and condition matters more than age), if having an illness disqualifies potential donors (there a few conditions such as HIV, cancer, or systemic infection the would prevent organ donation), how to manage prohibitive religious beliefs (most major religions in the U.S. support it as a final act of kindness) to being in a certain race or social class making one less eligible for a donation (race, income and popularity are not considered; blood-type, waiting time, geographic proximity, and sickness severity are prioritized), Jean-Mary confidently dispelled several myths and misconceptions. She even hit home with pointing out how detractors and skeptics have fears that being a donor is a healthcare and life-saving disincentive, that surviving family will have to pay for organ donations, and that some people try to sell tissues and organs. Jean-Mary candidly noted that it is the medical professional's mission and priority to heal and save our lives, how organ selling is illegal in the U.S., and that organ and tissue donation is not even considered until every life-saving method is attempted. Jean-Mary also introduced the audience to an organ transplant recipient who shared her story about becoming a world-class swimmer after receiving the transplant which was quite notable as she had not been a competitive swimmer prior to her diagnosis. This story was very eye-opening to the audience, helping everyone in attendance to strongly consider the lives that could be saved if everyone knew the true facts about organ and tissue transplants. To be more involved or to receive more information on donor referrals, log on to www.donors1.org or call 800-KIDNEY-1 (800.543.6391) or 800-DONORS-1 (800.366.6771). 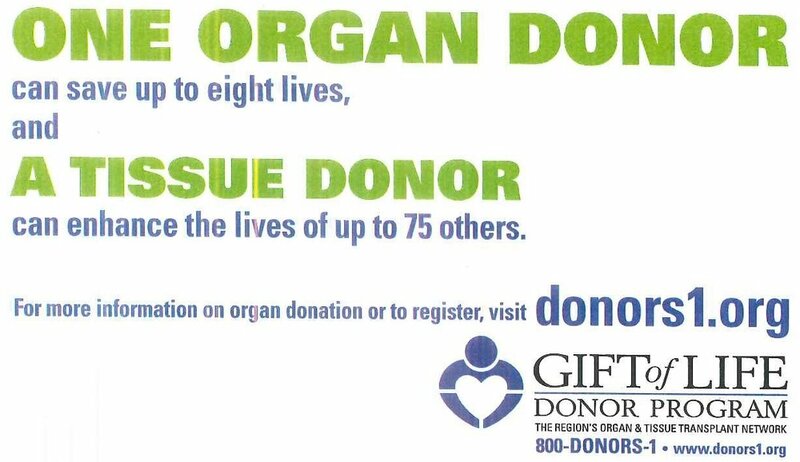 The need for organ, eye and tissue donors is on-going, so join Donate Life America by participating in one of our many observances throughout the year! Together, through spreading the word and educating others about donation, we can take small steps each day towards saving more lives. Below are downloadable images you can use throughout social media and links to other resources for you to utilize within your local and online community. National Donor Day is a time to focus on all types of donation – organ, eye, tissue, blood, platelets and marrow –by participating in blood/marrow drives or donor registration events. It is also a day to recognize our loved ones who have given the gift of donation, have received a donation, are currently waiting or did not receive an organ in time. National Donate Life Month (NDLM) features an entire month of local, regional and national activities to help encourage Americans to register as organ, eye and tissue donors and to celebrate those that have saved lives through the gift of donation. On National Donate Life Blue & Green Day, the public is encouraged to wear blue and green, hold events and fundraisers, and partner with local restaurants, malls, media, and community organizations in an effort to spread awareness about organ, eye and tissue donation and transplantation. Donate Life ECHO, which stands for Every Community Has Opportunity, is a nationwide observance designed to reach multicultural communities. Through the ECHO concept of reiteration and repetition—with people sharing the message of donation within their community—more lives will be saved and healed. The first-annual National DMV Appreciation Week took place in 2016. The DMV partnership remains the primary source of donor registrations. DMV and driver’s licensing partners are the people on the front lines of service who have helped register more than 130 million donors. DMV Appreciation Week is a time for the Donate Life Community to say thank you and show its appreciation of DMV partners across the country through national and local events and outreach. National Donor Sabbath is a three-day observance (Friday through Sunday) that seeks to engage all major religions in the United States. It is a time for congregations to learn more about the critical shortage, celebrate life and pray for those affected by donation and transplantation. On Sunday, April 15th, The Philadelphia Museum of Art was crowded with more than 12,000 eager participants for the 23rd Annual Gift of Life Donor Dash which celebrates the lives saved through organ and tissue donation, honors donors who have passed, and creates awareness for the need of more organ and tissue donations. Thus far, the campaign has raised more than $250K. However, Donor Dash teams are accepting financial contributions throughout the summer, so there is still time to contribute towards the event fundraising goals. 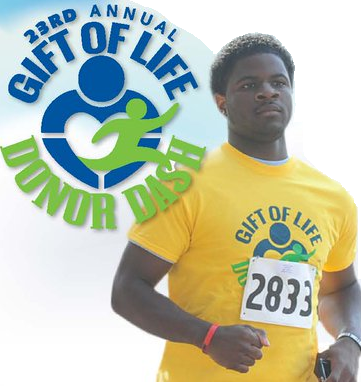 According to Gift of Life, more than 5,000 people in our region are awaiting a transplant. This event, which features a 10K and 5K Run, Kids Fun Run, and 3K walk, enables participants to help people obtain life-saving organ transplants and enjoy their lives. Spectrum supports this campaign by spreading awareness onsite and providing educational literature on registering as a new donor. 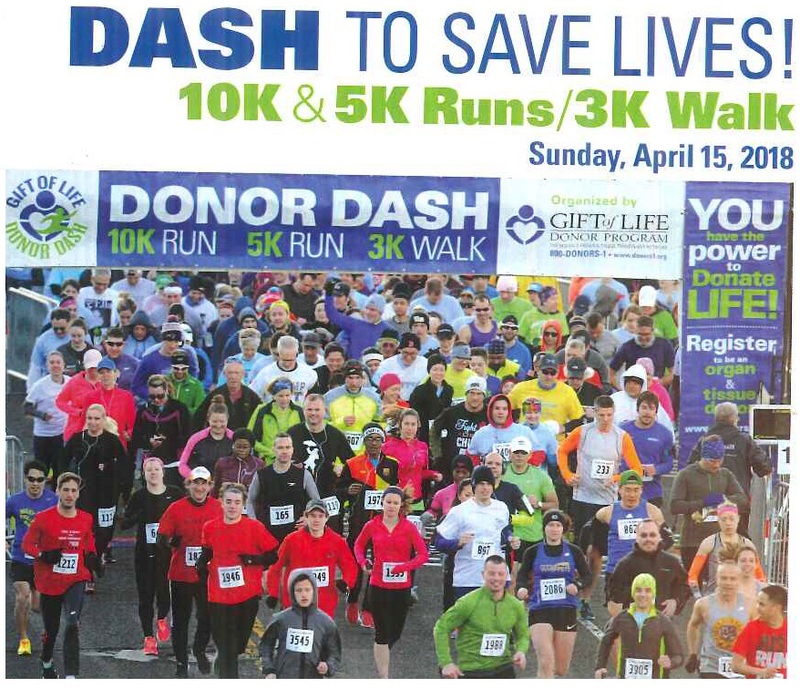 For more information about how to register, contact our behavioral health team at 215.471.2761 or to support donor dash teams visit donordash.org. During #WomensHistoryMonth , we acknowledge the strength, courage, beauty and exceptional talents of women. 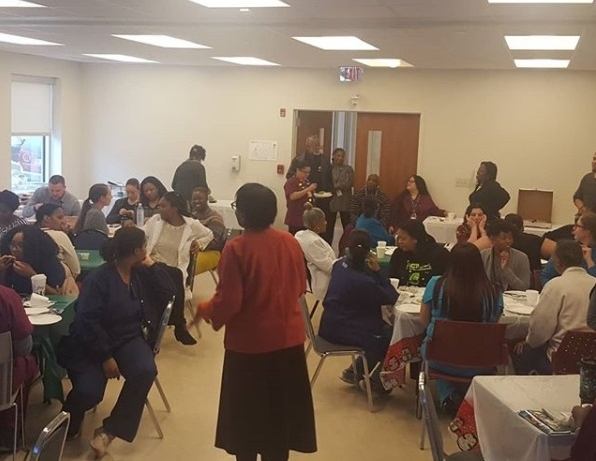 We informed the community about Chronic kidney disease (#CKD) that disproportionatley affects the female population, attended the #beexpophilly, and developed an employee #fitness and weight loss challenge. CKD is a worldwide public health problem that affects approximately 195M women and it is currently the 8th leading cause of death in women, with ~600K deaths each year. CKD is also considered a risk factor for adverse pregnancy outcome and reduced fertility. Spectrum wanted to address issues of equitable healthcare access for women where it is currently lacking and increase awareness and education amongst the staff and community by facilitating women’s access to treatment and creating awareness towards better health outcomes. At the Radio One BE Expo 2018, the hosts 100.3 WRNB, 107.9 WPPZ Praise Philly, and Boom Philly 103.9 WPHL,empowered, entertained, and educated the community with many major activities supporting women such as the Hip-Hop 45 panel featuring Roxanne Shante; The Moment vs. Movement panel on politics featuring Taryn Finley of Huffington Post and Philadelphia Councilwoman Hon. Blondell Reynolds Brown; Black Girl Magic navigating the workplace featuring rap star Remy Ma, K Foxx of WRNB, and Valeisha Butterfield-Jones of Google and WEEN; Reflections of Beauty and Health at 20, 30, 40 and Beyond panel featuring Cynthia Bailey of Real Housewives; The Black Love Experience panel featuring Philly’s own Kindred the Family Soul; Raising Kings about changing the image and expectations of men and boys of color through mentorship; High Heels and High Places which helped women who want to break through the glass ceiling of corporate America; as well as And I Danced, a film screening celebrating the dancers who birthed Hip Hop Culture featuring esteemed actress and choreographer Shane Johnson and rap-session moderated by Kimberly King of Scripps Networks Interactive. To support overall health and wellness, Spectrum has been having an 10 week employee weight loss challenge during which participants are working to improve eating habits, move more, and lose weight. Some healthy lifestyle tips to incorporate into their daily routines and share with the community include swapping out soda and juice for water, upping our veggies, exercise 30-60 minutes for 5 days per week, cutting out fried and fast foods, eating leaner cuts of meat, and getting more sleep. Contact https://rnbphilly.com for more the information on the Be Expo, and for more information on CKD and nutrition tips, contact our nutritionist CLiPuma@spectrumhs.org or call 215-471-2761. An important lesson in life we must all appreciate is that there are always other people who face tougher challenges than our own. Challenges can surface in various facets of our lives, whether it be for survival essentials such as food, clothing, and shelter or for factors of social mobility such as access to education, gainful employment, and healthcare. Many times we take for granted what others may struggle for. In order to walk out our values of treating all patients and each other with dignity and respect, we desire to reduce life's difficulties by doing our part to give back to the community. Giving back has been the core of our operation for the past 50 years, underscored by our sincere desire make a significant positive change in someone’s life. 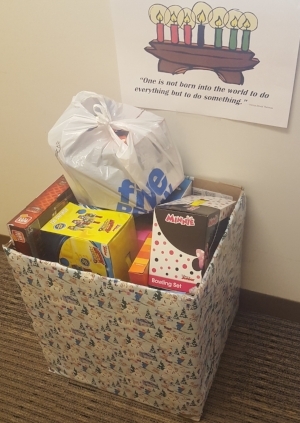 As a way to thank the community who makes our operation successful, Spectrum staff enjoyed time together to celebrate each other, show appreciation for a strong 50th year of service, and in the spirit of giving, pool our resources to collect toys and gift cards to give as holiday presents to select families. At this time of year, many organizations host thoughtful holiday gatherings. 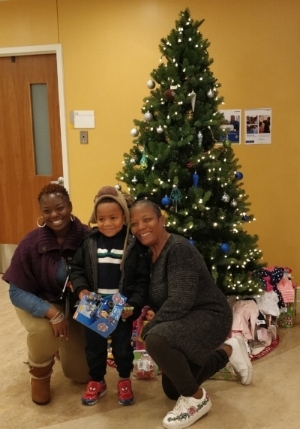 We want to share our holiday photos to show how our gatherings and community giving reflect the lifelong lessons of empathy and compassion that we commit to pay forward to the City of Brotherly Love for the next 50 years and beyond. Have a safe holiday and happy new year!